Singh swept with nearly 54 per cent of the vote. Jagmeet Singh celebrates with supporters after winning the NDP leadership in Toronto on Oct. 1, 2017. 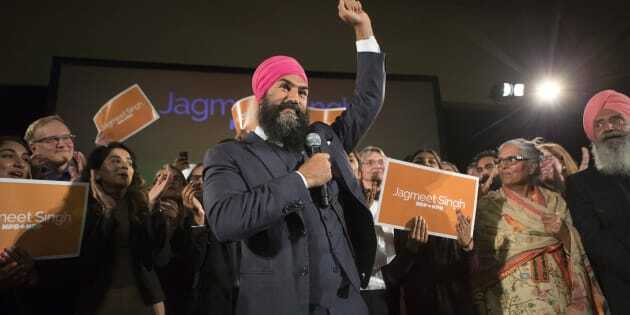 OTTAWA — The Jagmeet Singh juggernaut began barrelling towards Parliament Hill on Sunday as the 38-year-old turbaned Sikh bounded past his three more experienced rivals and claimed a historic first-ballot triumph in the race to become leader of the federal New Democrats. Singh, a charismatic, fashion-forward member of the Ontario legislature, became the first visible minority to claim the leadership of a federal party, romping to victory with a convincing 35,266 votes — 53.8 of the eligible ballots, well past the margin required to end the race early. Northern Ontario MP Charlie Angus, who was widely seen as Singh's closest challenger, came in second with a disappointing 12,705 votes, followed by Manitoba MP Niki Ashton with 11,374 and Quebec MP Guy Caron with 6,164. As Singh's victory and its margin became apparent inside the Toronto hotel meeting room, supporters leaped to their feet and hoisted their champion in the air before gathering behind him on the stage, many of them with tears in their eyes. "Canadians must stand united to champion the politics of courage over the politics of fear, the politics of love to fight the growing politics of division,'' Singh said, with supporters, friends, family members and fellow candidates crowded in around him. Singh told the story — a staple of his campaign — about his family's struggle to get by during a period when his father was unable to work. He described it as a "glimpse'' of the sort of challenges countless Canadians endure every single day, people whose priorities have been abandoned by government. "It's unacceptable that our government tells people to just get used to unstable work,'' said Singh, referring to Finance Minister Bill Morneau's infamous comments about what he considers the realities of the modern economy. Jagmeet Singh is shown with Charlie Angus and Guy Caron at HuffPost Canada's NDP leadership debate on Wednesday. Singh sang the praises of his predecessor Tom Mulcair as well as his rival candidates, whom he celebrated for helping to generate a renewed sense of excitement and vitality around the party over the course of the campaign. With its long-haul leadership race now over, the party — which has just 44 of the 338 seats in the House of Commons — is now free to focus on presenting a unified front to battle Justin Trudeau's Liberals in the 2019 federal election. Insiders and political observers alike say it's high time the NDP regrouped, put the disappointment of the 2015 election result in the past and start laying the foundation for a strong showing in two years. More than 124,000 card-carrying members were eligible to take part in the vote, which was conducted online and by mail by way of a ranked ballot — voters were able to rank the candidates in order of preference. Kathleen Monk, an NDP stalwart who worked as director of strategic communications to former leader Jack Layton, said a new leader will now allow the party to begin growing again after two years in the political wilderness. Mulcair, who took over the party after Layton's death in 2012, carried on his shoulders the party's long-standing dream of forming a federal government for the first time. Those hopes were dashed during the 2015 election campaign when the party's support collapsed in the face of Justin Trudeau's Liberal juggernaut — an electoral disaster many blamed on Mulcair himself. Even after party members voted resoundingly to turf their leader during a spring convention in Edmonton, Mulcair chose to remain on an interim basis until a successor could be named. Following that convention, the party opted to take the long road towards choosing a new leader, culminating in Sunday's first round of voting results. Jagmeet Singh speaks during HuffPost Canada's NDP leadership debate on Wednesday. "The reason I was able, with eyes wide open, to stay on after Edmonton is my profound belief that the NDP offers the only real hope for a progressive government in Canada,'' Mulcair said in an interview. The two front-runners brought diametrically opposed perspectives to the race: Angus the elder statesman, with years of House of Commons experience and name recognition among party members, versus Singh the outsider, a member of the Ontario legislature with a youthful, more suburban following. Former NDP national director Karl Belanger admitted it is "long overdue'' for the NDP to get on with building towards 2019. It's also high time the party got serious about fundraising: Elections Canada returns show the NDP has some $5.5 million worth of debt on its balance sheet. But perhaps most importantly, Job 1 for Singh will be to "knit together the teams that may have supported different candidates,'' said Peggy Nash, a well-regarded former NDP MP and leadership candidate who ran unsuccessfully against Mulcair.